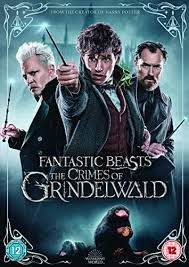 Fantastic Beasts The Crimes Of Grindelwald. Directed by David Yates. Distribution by Warner Bros Pictures. PG13, certificate 12 UK. Running time 134 Minute&#39;s.
Released today in the UK on DVD and Blu-ray a film that most have not liked, I'm torn by this movie as it has serious promise, but is seriously let down by a bogged down plot, and an insistence of tying up loose ends, or creating plot points that bridges the gap between this and the Harry Potter franchise. Where as I would've be happy to see a continuation of the characters I loved in the first Fantastic Beasts. We see Newt fight with his older brother, an old love interest that is fighting for his affection in Lita Lestrange and only brought in to tie her name into the Potter franchise. We have plotlines and timelines from the book changed to include Professor Macgonagle who should've never existed in this timeline but just added to fill the narrative. We have seriously underused characters such as Dumbledore ( Jude Law) and Grindelwald (Johnny Depp) in a film that ends up making no sense whatsoever, and the climax being Grindelwald is so evil he wants to stop World War 2 and the atomic bombs and genocide by eliminating the bad humans. This film isn't the complete mess some are saying, it does look gorgeous in places, and has some very good set pieces and CGI, with great cinematography, and was robbed at the Oscars. It still doesn't make sense though, I'm a Potter fan my daughter an even bigger Potter head didn't get it either and needed to Google the plotline to understand it. If this is the way this franchise is heading it will loose it's fanbase very quickly, or J K Rowling can learn lessons, listen to her fanbase and instead of being hell bent on bridging this to the Harry Potter franchise, just make the other three films enjoyable with the characters we have already fallen in love with, and stop making it so dam dark and confusing.